Dental bridges are basically “new” teeth (look similar to a hollow crown) that are used today to quickly replace missing teeth or gaps. A dental bridge restoration in Thailand is usually attached to two other teeth ( dental crowns ) near the area being treated thus “bridging” them together. The mouth bridges are one of the most common cosmetic dentistry treatment for people looking for a new look by fixing gaps and cracks in their smiles that is causing a negative effect on the aesthetics of the smile, also affecting the ability to eat and communicate. Having gap teeth can also cause you to lose confidence in your appearance. Dental bridges are designed to quickly and inexpensively fill any vacant gaps and instantly improving your smile while fully restoring your gums and teeth to a healthy state once again in as little as a few days. Our Cosmetic dentists are experienced and have established themselves as the premiere providers of affordable dental care to thousands of loyal patients each year. The reason is quite simple. Our caring staff and affordable proces for vaneers, Zygomatic dental implants ,dental bridges and mini-dental implants are the main reason why Thailand has become the leading destination for cosmetic dental tourists. We offer several types dental bridges depend on your existing oral health along with the existing strength of the remaining teeth along with the exact location of your gap. 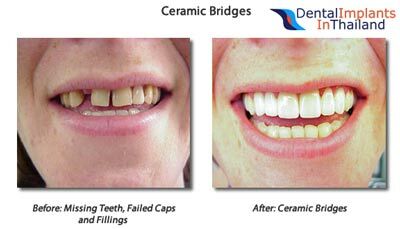 Traditional fixed bridges that are made from false teeth material known as “pontic” is the most common type of dental bridge we offer. Conventional bridges function when we fuse two crowns permanently to the desired location. Another types of dental bridges are known as the Adhesive Bridge (Maryland dental bridge) and lastly the cantilever dental bridges. An Adhesive “Maryland” bridge is ideally used when the dental gaps are at or near the front of your mouth. Maryland bridges be made in ceramic or gold materials and also the newer gold/ceramic combination bridge. The cantilever bridge is usually needed when there are not enough healthy teeth on any side of the dental gap. Having new Dental bridges may be the perfect solution for people wanting to combine a vacation/fun trip abroad while fixing some loose or missing teeth. The new look you deserve can help boost your overall self-confidence by quickly improving the aesthetic nature of your smile with the functional benefits of being able to eat properly and speak clearly. The actual dental bridge fitting procedure is painless,relatively uncomplicated and best off all inexpensive and can be easily custom-designed by our skilled dentists in Bangkok or Phuket to blend in naturally with your existing teeth in as little as 2 short visits. No one will know how you got such a stunning smile unless you tell them. Prices for having dental bridges in Thailand start at only $450 Dollars per tooth with bigger discounts given for multiple teeth. 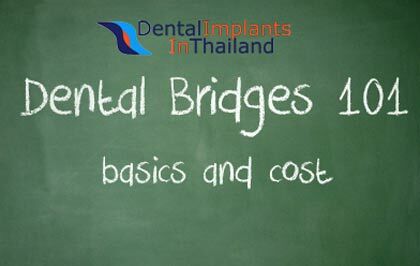 The cost of having Dental Bridges placed in Phuket are usually around 20%-35% higher than prices in Bangkok. If you are looking for a total no-hassle dental treatment package, We also offer a complete dental holiday that include the bridge,Boutique recovery hotel and round-trip airport transportation for you + 1 guest. For more information please contact us. To learn more having dental bridges at the Dental Center of Thailand or if you are interested about our other high-quality yet affordable medical & dental treatments please contact us today.